SMOK TFV8 Big Baby Beast Tank Atomizer features convenient top filling design with hinge lock, dual adjustable airflow control at base, black delrin ultra-wide drip tip and patented baby turbo engines coil structure. 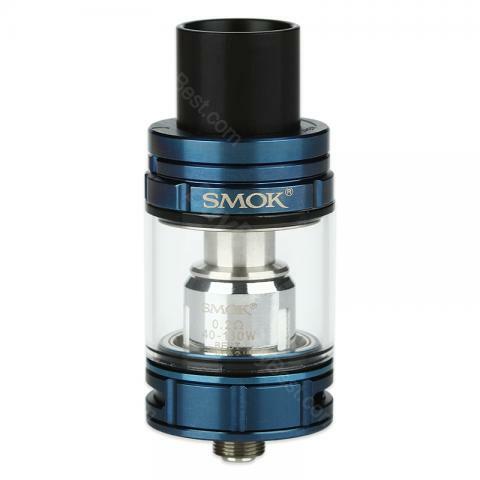 The SMOK TFV8 Big Baby Beast is a 24.5mm sub ohm tank that utilizes the wide selection of Baby Beast Turbo Engine Coil Heads which makes cross-compatibility extremely convenient. TFV8 Big Baby Beast atomizer has a huge juice capacity tube up to 5ml and is made from superior stainless steel construction, features convenient top filling design with hinge lock, dual adjustable airflow control at base, black delrin ultra-wide drip tip and patented baby turbo engines coil structure. A variety of colors for your personalized choice. Hold the tank with one hand, and use another one to press top cap and move it clockwise. Close the cap carefully and firmly. Then let it stands for several minutes to get the organic cotton completely saturated. Firstly, screw the drip tip and top cap off the tank; then screw the atomizer core off the base part, and replace with a new one. Control air input: Rotate the bottom adjustable airflow system to control air input. Before starting make sure your hands are clean. Cutting a strip of cotton and make sure it’s not too much and not too less. Inserting the cotton, and placing it in the middle. Cutting the cotton at an angle and make sure it’s not too short and not too long. Wet the coil with your e-liquid and adjust the cotton. • EU Version is ONLY applicable for V8 Baby-Q2 EU Core. Standard Version replacement coil is NOT compatible with EU Version. • You can buy Baby-T8 Octuple Core, Baby-T6 Sextuple Core, Baby-X4 Quadruple Core, Baby-Q2 Dual Core and Baby RBA Coil for TFV8 Big Baby Standard Version. • It is compatible with SMOK T-Priv TC Kit and SMOK T-Priv MOD. I am using different tank at the moment but this one is very suitable to me. It’s worthy to buy for me. Postal service is very good too. I fell in love with beast tank the first time I use it. I am follower of this tank. Buybest is really good. Good price, fast shipping. Many friends recommended this tank. I tried it and feel good. I will vaping on this when tired of building RDAS. This is one of the best tank I had. I usually vape it with 80 watts. Vey easy to use. A tank worth having for a long time... Purchase a gold one as a replacement. Amazing color. I bought it to replace the old one on my allien kit. Love the flavor. Love my allen.